I know it's a bit odd to post a whole load of pictures without saying anything about them. However, while I'm not wanting these to get too dislocated from the time they were taken, I don't want to mislead by labelling them wrongly either. At the moment, my printer isn't working properly. When it's back to normal, I'll take these pictures to the Nature Centre and ask for help in checking what's what! Then - I'll return to these seaweed posts and add labels. In the meantime, I hope you enjoy seeing these plants as much as I do. Last week, I posted photos of leaves and fronds (I expect there's a better technical term - that's something else I need to find out) which had been detached by the sea or the season from wherever they have been growing during the year and had been washed up on the beach by the sea. This week, we're looking first at sea plants attached to rocks on the beach. And here's a close up. Aren't they remarkable? The plant above has found a place high on a rock. I don't know if it's ever covered by water or just spray-washed. It's the kind of thing I'd find it hard to check in person. I can hardly sit at the foot of the cliff and wait for the tide to come in. By the time I knew the answer, I'd be drowned - so I wouldn't be able to report back to you. I need to find a book! And here's an independently minded individual which sits like a King of Shellfish (see them?) on its castle. This plant must be happy to be submerged by the tide. What a strange life! In other places many varieties crowd for space. I was going to count how many there are on this rock but realised I was getting confused. At different stages they change appearance. For instance, leaves which are flat grow the balloon-like bits (technical term to be learnt!) which are fun to pop and make it look like a completely different plant. I'm also uncertain how much colour is affected by light. Can the same plant change colour depending on the light available to it? There are other confusions. This little snail looks bright and vulnerable. Draw back - and we can see why bright yellow turns out to be good camouflage. It's also interesting to find leaves out of context. 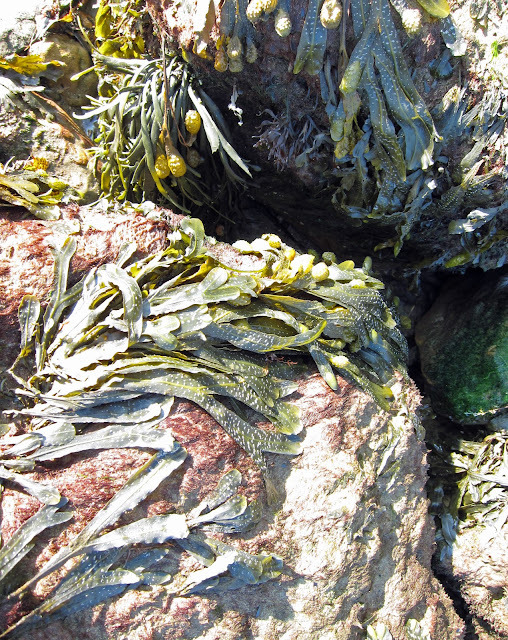 Amidst this pile of this and that seaweed a . . . It's non-stop variety and colour. Story books give the impression that seaside and seaweed are almost synonymous but that's as daft as expecting to find apples in spring or snowdrops in summer. The sea and its contents (don't quote me!) seem to have their seasons too. Very strange, Monica, aren't they! About the nature centre looking at them on line . . . In part, it's a matter of who to ask. The Nature Centre is staffed largely by volunteers. Some are experts in their fields. Some are not. And it's a bit hit and miss who's there at any moment. Even within this small geographical area there's so much 'nature' that specialisms abound. I went in to ask about a reed and a seashore plant once. They answered the seashore plant question immediately. For the reed . . . they recommended I went to a different nature centre, on the other side of town. I'm thinking a little pack of photos might mean the 'right' person could look at them at their convenience. I'm wanting to have a little bit of knowledge too before I approach them so I don't look quite the ignoramus I am! I'm astonished that bookshops beside the sea have acres of shelves devoted to gardening and virtually nothing about the seashore. You'd have thought, at the very least, visitors would be interested - but fancy living by all this all the time and ignoring it! 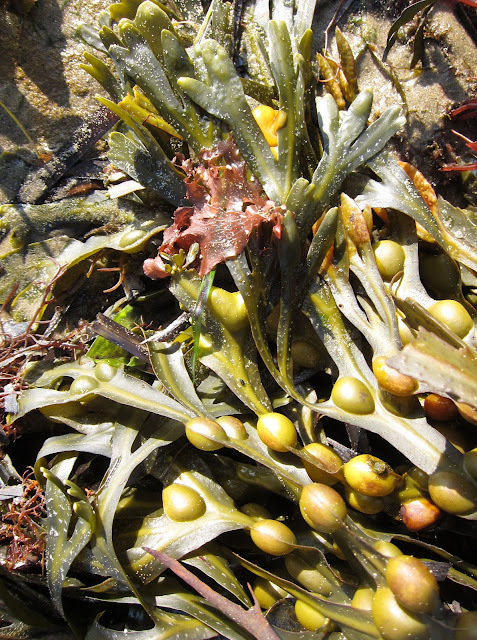 Have you been able to ID any of your seaweed? 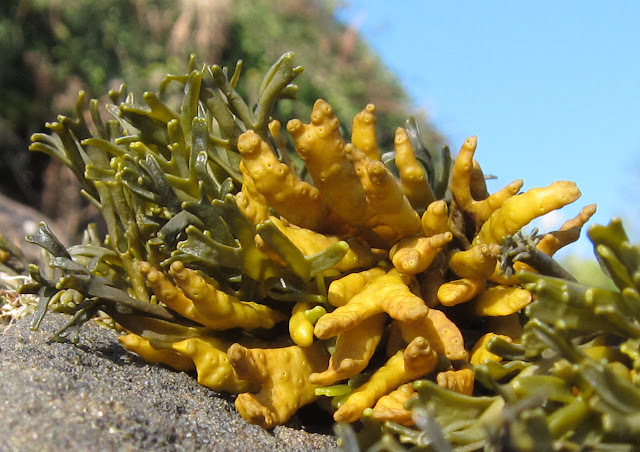 We have a guide to seashore life which includes seaweed. Your species wouldn't vary all that much around the shores of Britain would it? Except for Gulf Stream vs cold? Have you eaten laver (sp?) bread? We had some years ago when we were on holiday in Wales? He looked at it suspiciously tried a bit, then wanted to eat my whole portion! Its leavesnbloom on there too Lucy - only all I've done is register so far - I've been so engrossed in my camera manual all evening and reading up on taking firework photos for Friday night I never got around to adding any photos yet for id.